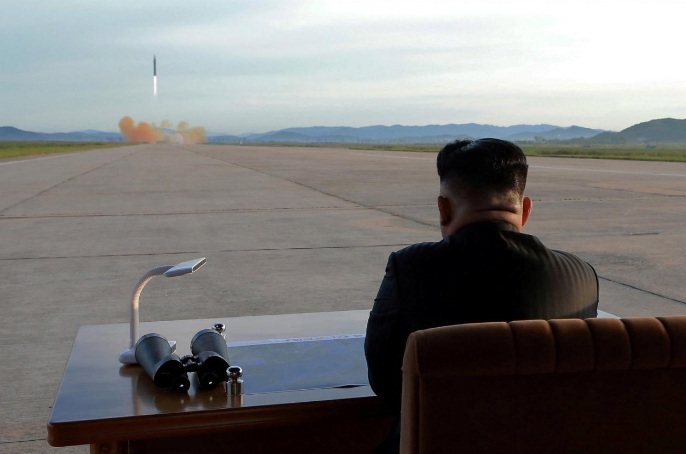 FILE PHOTO: North Korean leader Kim Jong Un watches the launch of a Hwasong-12 missile in this undated photo released by North Korea's Korean Central News Agency (KCNA) on September 16, 2017. SEOUL - North Korea’s leader Kim Jong Un said on Friday the North will consider the “highest level of hard-line countermeasure in history” against the United States in response to U.S. President Donald Trump’s threat to destroy the North. Calling Trump “mentally deranged” and his comments “the most ferocious declaration of a war in history,” Kim said his U.N. speech on Tuesday confirmed Pyongyang’s nuclear program has been “the correct path”. “His remarks ... have convinced me, rather than frightening or stopping me, that the path I chose is correct and that it is the one I have to follow to the last,” Kim said in the statement carried by the North’s official KCNA news agency, promising to make Trump “pay dearly for his speech”. Trump had warned the North Korean leader in his U.N. address on Tuesday that the United States, if threatened, would “totally destroy” the country of 26 million people and mocked Kim as a “rocket man” on a suicide mission. It was the U.S. president’s most direct reference to military action so far against the North, which conducted its sixth and largest nuclear test on Sept. 3. In addition to the nuclear test, North Korea has launched dozens of missiles since Kim came to power in 2011. Two recent ballistic missiles flew over Japan as Pyongyang advanced toward its goal of creating nuclear warhead-tipped missiles that can hit the United States. Kim said Trump would face “results beyond his expectation,” without specifying what action North Korea would take next. “I will surely and definitely tame the mentally deranged U.S. dotard with fire,” Kim said in the rare direct statement, referring to Trump. A day after Trump’s address, North Korea’s Foreign Minister Ri Yong Ho had likened Trump to a “barking dog,” saying his comments were no threat to the North. Kim took a page out of Ri’s book on Friday, saying “a frightened dog barks louder”. “Now that Trump has denied the existence of and insulted me and my country in front of the eyes of the world.., we will consider with seriousness exercising of a corresponding, highest level of hard-line countermeasure in history,” Kim said. North Korea’s leader Kim Jong Un said on Friday the North will consider the “highest level of hard-line countermeasure in history” against the United States in response to U.S. President Donald Trump’s threat to destroy the North.